Thank you to everyone who entered the giveaway for the mulling spices to make spiced cider. There were 40 entries total, and five winners drawn. I used random.org to generate five numbers. Please leave me a comment with the address you would like me to mail your spices to. I will not publish your comment so others won't be able to see your address. This is the final part in my "Favorite Fall Recipes" mini series. These corn muffins make a great accompaniment to chili. They are good on their own, but they become truly phenomenal when served freshly baked, split open and slathered in lots of honey butter. Preheat the oven to 350 degrees. Line muffin cups with paper liners. In the bowl of an electric mixer, cream the butter and sugar until light and fluffy. Add the eggs and continue beating until incorporated. Turn the mixer off, add flour, cornmeal, and baking powder to the bowl and turn the mixer on the lowest speed while slowly pouring milk into the bowl to incorporate the dry ingredients. Mix until just well combined. (If necessary, add up to 1/2 cup more milk to get a batter that is neither dry, nor runny - it should be very moist but hold its shape). Scoop approx. 1/4 cup of batter into each muffin liner - an ice cream scoop works great for this. Bake for 18-20 minutes until the tops are turning golden and a toothpick inserted comes out clean. Cool slightly before removing from pan. These corn muffins do make a nice breakfast side dish, too. Simply whip up the batter the night before, refrigerate overnight, and scoop out and bake fresh in the morning. Combine the honey and butter in a bowl with an electric mixer or a stick blender. Serve at room temperature along with corn muffins. This bean dip is pretty legendary around our church, thanks to my husband singing its praises to everyone and making them try it. Once they do, of course they agree it's the best food they have ever tasted, period. This item goes super fast whenever I bring it, the dish gets scraped clean, people beg for more, and those who didn't get any start crying and offer their firstborn in exchange for the recipe. Or something like that. Are you ready? There are only a handful of ingredients that go into this, so it's super important that you buy the exact right ones, or it won't come out tasting like mine. Which would be a tragedy, and you'd be back to square one on the weeping and wailing part. Brown the ground beef, then season with taco seasoning. Add it to a 6-qt slow cooker along with all other ingredients, stir thoroughly to combine, and heat on low until cheese is melted and the dip is hot, about 2 hours. Serve with corn chips (duh). So easy, so quick, and so delicious that your family will adore you forever. 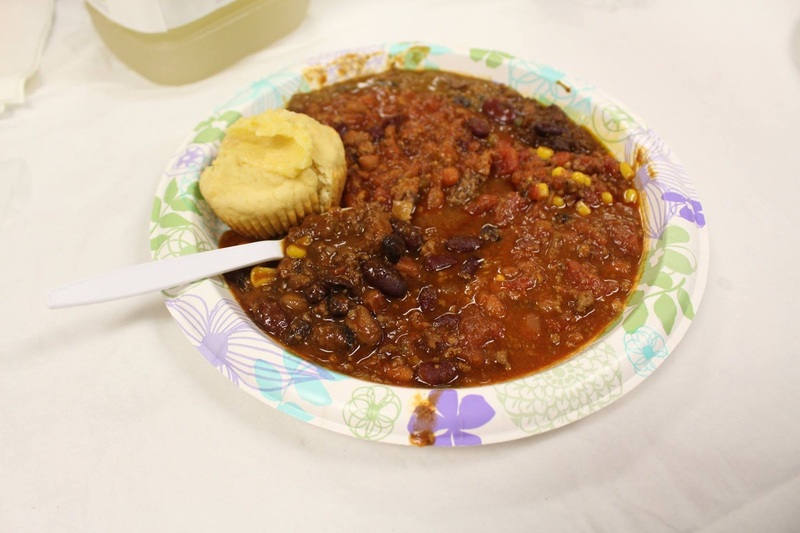 Each year on October 31st, our church hosts a Chili Cook-off as an alternative event for people to attend who do not celebrate Halloween. This avoids having to answer the door to trick-or-treaters, or hiding out at home with the lights off. When we first began this tradition 11 years ago, only two chilis were entered. 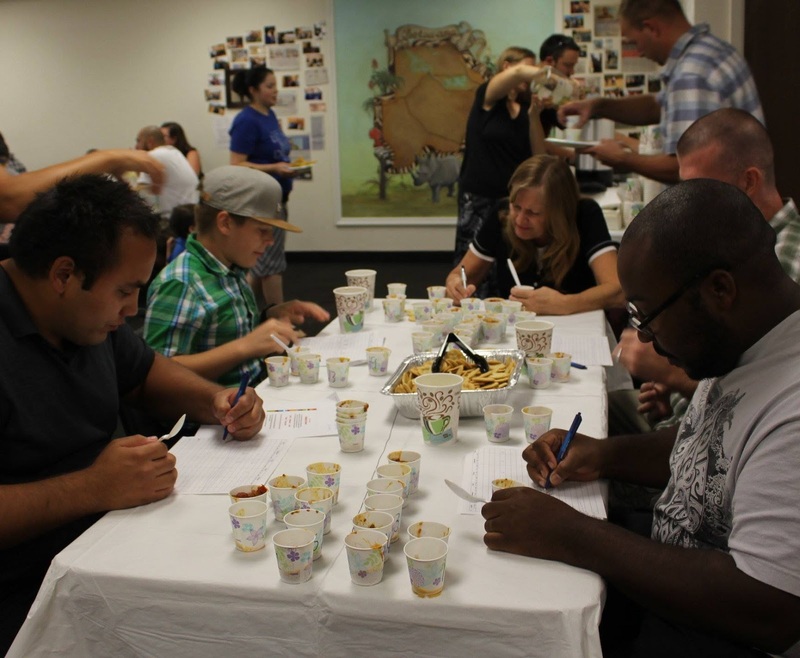 By now, we have to limit entries to the first 20 chilis, and the competition is pretty stiff. 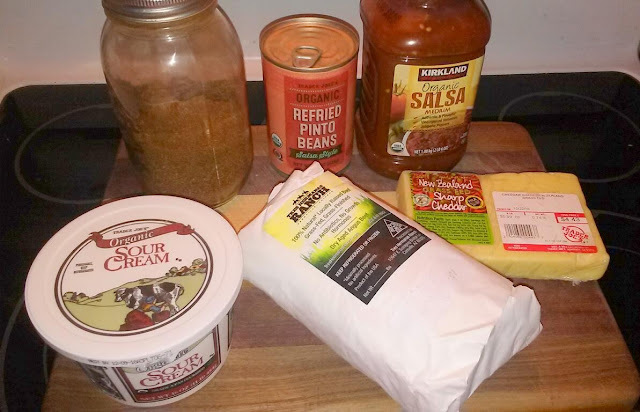 Since my husband as the pastor is an all-time judge (the other four are randomly drawn), I never enter a chili myself, but every year I do provide the three main sides. Funny side note: my husband's mom was in town for our cook-off this year, so she took his place as a judge. Here's a picture of the judges' table because I didn't have one of the spiced cider - though you can see me in the background pouring another gallon of it into the dispenser. This year, I made 15 gallons of spiced cider, 3 gallons of bean dip, and 180 corn muffins. All three ran out halfway through the evening, so I'll have to up my game next year. Like every year, I got asked for the recipes of these foods, and I promised to share them on my blog. So I bring you this mini-series of my favorite fall recipes. In a large pot, combine all ingredients, stir to dissolve sugar, and heat over medium heat just until very hot but not boiling. Immediately strain the mulling spices out and serve hot or cold. Caution: If the mulling spices are left in longer than it takes to heat the spiced cider, they will make it turn bitter. 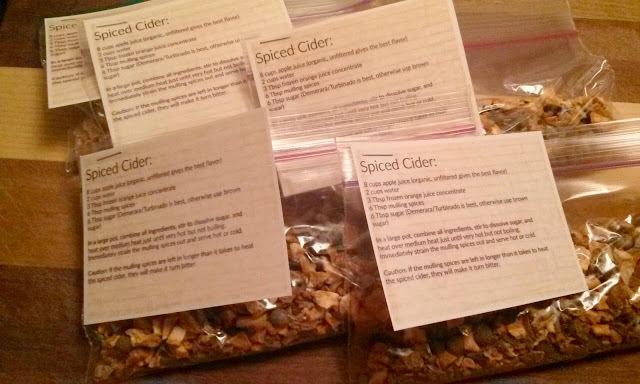 Since I know that the biggest hurdle to making this spiced cider is finding the mulling spices, and since I made 2 1/2 lbs of it for the cook-off and have some left over, and since this blog post really needs another photo (ahem), I am hosting a little giveaway of packets of mulling spices. Leave a comment below and be entered into a random drawing of FIVE readers that I will mail one of these single-serve packets to (free, of course). US only, ends this Sunday night.